The Stutthof Concentration Camp was the first Nazi camp built outside of Germany and was the last camp liberated by Allied forces. It lies 34km outside Gdansk and was the place of death for 85,000 people according to official figures, although the actual number killed is assumed to be much greater. Originally a small prison for Poles and P.O.W's, the camp would become the site of some of the worst atrocities of the war. 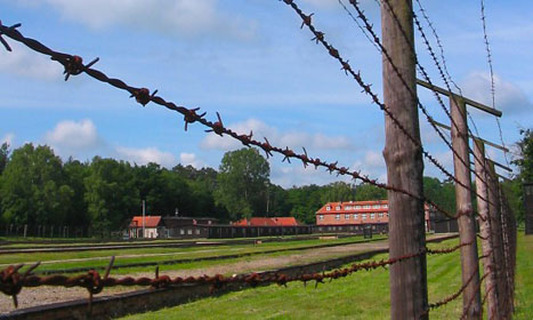 Between 1939 and 1945, 127,000 prisoners were officially registered in the camp, but those who were immediately singled out for execution were not registered at all, so there is no way of knowing the exact number of people brought to Stutthof. The camp was managed by an SS officer named Max Pauli, who would later be sentenced to death for the crimes committed here. While there was a gas chamber here, as well as a number of wagons which were converted into gas chambers, the most shocking and disturbing facility was invented and operated by a man named Rudolf Spanner. He had discovered a way to use the fat of murdered prisoners in the production of soap, and hundreds of victims of the Stutthof camp were used to make 'Reines Judische Fett' or 'pure Jewish fat.' After the war, Spanner escaped arrest, despite the severity of his crimes. Finally liberated on May 10, 1945 by the Soviet Army, the camp was shut down and its prisoners were released. People from 26 different nations had been kept there, a testament to the scale of the Nazi war effort. Today there is a museum at Stutthof, open Monday through Friday from May 1st until September 30th: 8:00 - 18:00, and from October 1st to April 30th from: 8:00 - 15:00, with free admission. On Mondays there are no guide services, and no film shows. It should also be noted that, in accordance with Polish law, children under the age of 13 are not admitted. I visited the camp in 1975 when I was 13 years old. It was a truly life changing experience. I became a music educator and have shared the experience with many students. I remember how horrific the pictures were. To view the ovens and mass graves was something I shall never forget. This account is unfortunately riddled with inaccuracies. The story of Spanner and the manufacture of human soap is largely fake news and the Russian estimates of deaths at Stutthof compiled at the time are likely to have been overstated. for political reasons. Equally mass gassings of inmates would not have been possible in the small gas chamber in the camp and there seems precious little evidence to support the contention that railway trucks were used as mobile gas chambers. But remove the fictional elements and you will find that the stark truth of a death toll in the tens of thousands and of callously casual murders in a forced labour camp in which inmates were fed only starvation rations is evil enough. And incidentally the original commandant Max Pauli wasn't executed for crimes committed at Stutthof but because if what he did at Neugamme, his next SS posting. I am learning about Stutthof in my holocaust class and I came here to see when Stutthof was open and about Rudolf Spanner and the soap! Thanks! Visited Stutthof today. Left the camp with a strange and sad feeling. But I am really satisfied been there. Went by bus 870 from Gdansk glowne bus station. Departure once an hour. do you know the exact day they opened the camp ? The first prisoners were transported there from Danzig on 1st September 1939 and camped at the site under guard while they built their own prison camp in the following weeks. I am trying to get some information on my mother's uncle.He had killed in Stutthof. My mother's uncle name is Eduards Ramanis. Any information would be greatly appreciated. I visited Stutthof in 97 when working in Poland on à projekt. very moving, however the polish person that I visited the camp with was very conflicted about visiting the camp since many poles, as well as russians, ukranians, latvians etc were no friends to the jews during this period. although the germans were the enablers of the holocaust its too simpel to think that all poles were heroes as some of the posts on this site suggest. this part Of poland had been part Of prussia before 1919. so thats only à gap of 20 years. a most sobering visit. god help us from this ever happening again. How is this awesome. It is a sad qnd embarrassing part of our past. We should be ashamed of thinking of this being "awesome". No harmful feelings, ok. But that wasn't a good response. A terrible site it must have been. Well kept camp, but no (few) translations of comments to pictures into english or german.-. My wife and I was there last weekend and we took a Taxi from the hotel in the Old City of great Gdansk; Zloty 260,- back & forth incl that the taxidriver waited for us in 1 1/2 hours. I am trying to get some information on my grandfather and his family. According to my father my grandfather was liberated from Stutthof, but was in Dachau for a period of time. My grandfather's name is Noham Buchinsky (Buchinski). Any information would be greatly appreciated. I have just discovered that my father, Edmund Chilla, was a prisoner in Stutthoff. He was somehow released from there and went on to survive the war, eventually settling in the UK - meeting my mother and I am the product of that relationship. Do you know much about his time in Stutthof how he survived. I'd be interested because having written a small book about the camp in English I'm now researching a much fuller history for publication. I visited Stuthoff in July this year while holidaying at Stegna close by. Stegna is a very pleasant summer holiday destination and the narrow guage railway which served the camp is still in use. I thought it was a constant reminder of how thousands of people had made a journey to there deaths in the camp on the same lines. Stuthoff itself is so quiet and green it is diificult to feel the real horror of the crimes perpetrated there (there are many accounts on the Web of the experiences of former prisoners). a must to visit. It was shocking to see what all they poor people were put through but it was also very interesting and in some parts very up setting . I really enjoyed this trip and it is worth every minute of it! I recently did a paper for my Medical Law and Ethics class. I started with Hippocrates, then to Leonardo Da Vinci, and then on to the Holocaust. I have studied this time period off and on since I was a teenager, but dug pretty deep with my college paper. My heart goes out to all who have suffered such an atrocity. These are stories that need to be told until the end of time. I'm actually thinking of changing my course of study. I'm not really sure where to go with it, I just know that I need to do something. Hi! I am Erasmus student and I would like to know how I can arrive to Stutthof by public transport. Could sb help me, please? My family just returned from a visit to the Stuutthof Concerntration Camp. A long time wish as a parent was for my daughter see this with her own eyes vs. reading about it in a history book. The grounds are a sacred place. We had a local private guide, car and driver. We will never forget this sobering & horrifing experience. The piles of shoes, the gas chamber, and the pictures of the prisoners will always be in my mind and heart. Good afternoon! What is the easiest/fastest way to travel from gdansk to the concentration camp? Thanks in advance for your help! I agree. To see people be so rude is heart breaking. A Camp like this should be honored and NOT diluted. Even an elementary school child could identify the difference in a time to goof around and a time to shut your trap. A Polish friend of mine took me to see the camp at Stuttoff some time ago and I can still sense the silence and the atmosphere. Seeing the names of some lost souls on some posts was very sad for me to see. My friend said after he has never known me to be so quiet. Despite learning about history at school the sense of horror only hit me on this visit and I think on it often. I have been there twice, you don't speak as you look, only see and listen. It is a sobering reminder of what we are capable of. I pray it never happens again. I take anyone I can there. you pppl need to realize this is for research not for making stupid commmentns about something you know othing about!! get a life!!!! I visited this camp back in the early seventies.I can vividly remember the pile of shoes taken from the prisoners it was about 6ft high.My imagination ran riot in the prison blocks which also incorporated a surgery a room about 10ft x 8ft.I think more used for experimental purposes than the welfare of the prisoners.I will never forget the tranquility of the whole area of the camp i never heard a bird whistle. We visited Stutthof last Sunday but now reading these pages I realise how much deeper the horror was than I did when there. One sign perhaps of the beginnings of healing was a bird nest in one hut with the babies being fed. Other than that I could neither see or hear bird life. My wife and I were on a Cruise recently and went to visit Stutthof. It is hard to beleive what happened to people at the camp. Please do not close your Museum because generations need to know the terrable things that appened in that camp. It is heart breaking but very impressive. I am taking a great interest in the camps during ww2, having been to several, Auschwitz- Berkanau, Bergen Belsen,Treblinka, Soribor, Dachau to name but a few, Stutthof is on my list and I find that those who help retain the camps for this generation to see do a great job, we must ALL help towards this sort of crime against humanity NEVER happens again, I am an ex forces and I am unable to bring myself to understand WHY other human beings could do such things to other humans and WHY was it permitted to go on, I will find the answers I am looking for, the main one WHY?. God bless those who suffered and perished, at the going down of the sun and in the morning, we will remember them. My Aunt is actually going to visit this camp on July the second. I can't believe that human beings could do this to other human beings, these serial killers, that is what they were, couldn't have suffered enough for their sick,twisted and sadistic crimes. Thank you Poland for keeping the Stutthuf memory alive. We must never forget and you must preserve the camp for others to witness for all time. I have been a visitor to Poland many times. I have many friends in Poland and know it to be a proud country. My father and mother worked in production of war goods in the United states during world war II , and my father in law was in the U.S. Army. He fought in many battles against the germans, and also was there in liberate the Polish People and the jews . The atrocities committed against the people were horrific. The German people at this time were the worst. These things whould never be forgotten, and atrocities such as this never allowed to happen again......I have been to many places in Poland and have viewed so much. I have to say to the Polish people God Bless you, You are a couragous and proud People. It is an honor to be your friend. There was no mass production of soap! Get that straightened out. I visited Stutthof in August 2008. We were driven there by a private taxi and did not realise until we were there that our driver's grandfather and grandmother had been there, one died there and one survived. It was an experience i will never forget. I did not know much about the holocaust before but this knocked me off my feet. It was a very sad place but a place where if you get the chance you must visit. I think every school child should be told about the holocaust in school. I'm not sure what "John" meant when his review said "I loved it". This is a testament to man's inhumanity to man. Maybe the Polish government should reverse its policy about no children under 13 permitted. This lesson should be learned as early as possible in life. Having visited stutthof last week(30th may 2008)I felt obliged to encourage anyone who gets the chance to visit the camp and pray that we can make sure that this murder and humiliation never again be allowed to happen.Poland is a beautiful country and the polish one of the friendliest nations i have met. it was a sad time for everyone . i hope that it will never happen agian.there needs to be more information on this page. I visited the camp in September 2007. I was also aware of the silence and the lack of birds, however I was struck by the amount of butterflies, especially those flying in pairs. Each time I went into one of the huts I experienced nausea and headaches. The museum is a reminder of all those who suffered and are still suffering. May we never forget. I remember upon entering the camp in 1986, the immediate sickly feeling in the base of my stomach,i also recall the eerie silence,no birds were singing all you could hear was wind russtling in the trees.You could feel the dead around you, welcoming you in.To this day i remember it all as if it was yesterday. There is so little written about Stutthof concentration camp that it is nice to see that it is being mentioned. My stepfather was born in this camp, so we have visited on several occasions. Each time is striking. We should support these museums so that this history will never be wiped away and forgotten! Sandra, my mother-in-law was born there. We are looking for all information we can find to determine who the father was. We think it was a German officer. She was a polish prisoner. Were you able to find documentation of your stepfather's birth? We are looking to find as much info as we can get and are asking for anyone that may be able to point us in the right direction. Thanks!